After intense networking, intro requests, and pitches, you have finally landed a term sheet. Signing it will give you much-needed growth capital to take your startup to the next level. You will be able to hire more team members, build out the game plan, and zero in on the needs of your best customers. Most importantly, it will let you, the founder, get back to building the business instead of fundraising. Unfortunately, this is often the time when most startup founders agree to terms that they regret later. 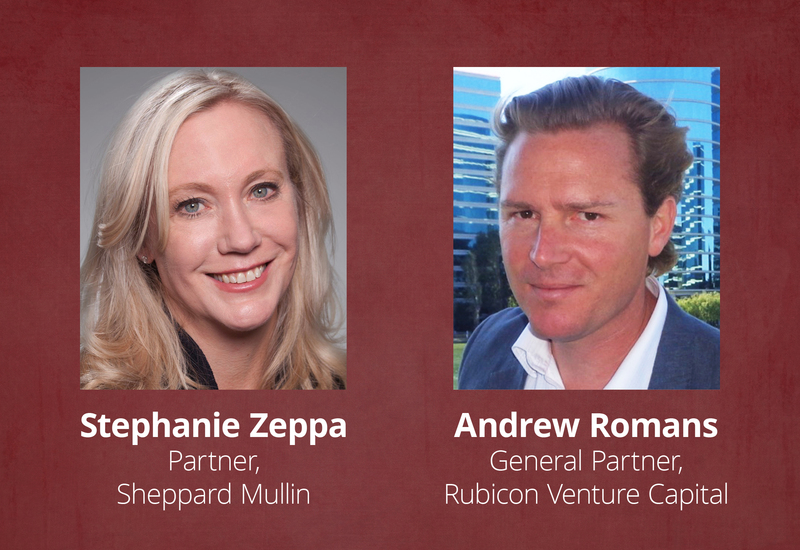 Join us for a lively discussion from two important perspectives: a corporate attorney and a VC. After a breakdown the do’s and don’t’s of terms sheet negotiation, attendees will have an opportunity to participate in a Q&A session. There will also be a drawing for a free signed copy of Andrew’s book, Masters of Corporate Venture Capital. Stephanie has extensive experience representing both private and public companies in mergers and acquisitions, investments, strategic transactions and corporate governance matters. She also represents emerging growth companies, founders, and institutional and strategic investors with the formation, financing, and exits of emerging growth and technology companies. She serves clients in the software, life sciences, and digital media industries. Her clients describe her as “an excellent negotiator” with a “broad understanding of issues.” (Chambers USA Northern California: Venture Capital and M&A). Stephanie serves as an advisor to VLAB, Astia, and UCSF CTSI’s Catalyst Awards Program. She received her J.D. from UC Hastings and her B.A. from Pepperdine. Stephanie enjoys running, stand up paddle boarding, and riding bikes with her kids. Sheppard Mullin’s Emerging Growth practice is a leading advisor to start-ups in the United States, Europe, and Asia. With 780 attorneys in 15 offices across the globe, we provide “one-stop” legal services to help an emerging company grow. Based in Silicon Valley, Andrew is a successful VC-backed entrepreneur, author of two top-selling books on venture capital, former tech VC and M&A investment banker, cofounder of an angel group, and now general partner of Rubicon Venture Capital, a VC fund active in Silicon Valley, New York, and Europe. His books, Masters of Corporate Venture Capital and The Entrepreneurial Bible to Venture Capital have been translated into Chinese, Japanese, and Russian by major publishers. Andrew raised over $48m for tech startups he founded by the age of 28. He has continually raised VC funding as a founder, banker, or VC ever since. He was the founder and general partner of The Founders Club and also acted as the managing director of EMEA at VC-backed Sentito Networks (acquired by Verso Technologies) and managed enterprise software sales in Europe at VC-backed Motive Communications (NASDAQ IPO). He is also a frequent VC guest speaker on TV shows including MSNBC, CNBC and ABC, as well as various TV channels in China and Russia. He was born in Japan, lived in Europe for 15 years and is fluent in English, German, and French and can speak conversationally in Slovak. He began his career in 1993 working in the UNIX computing industry at Pencom Systems in New York, Silicon Valley, and Austin. He holds a BA from the University of Vermont and an MBA in finance from Georgetown University, which he completed on scholarship. Andrew’s new book Masters of Initial Coin Offerings – ICOs & The Blockchain, which focuses on the rise of Bitcoin, Ethereum, Cryptocurrencies, token economies and what it means for startups, large corporations, sales & trading and venture capital, will be available soon.